In The Body is a Big Place human beings with an experience of organ transplantation – recipients, donors and donor kin – are shown roaming vast underwater spaces. 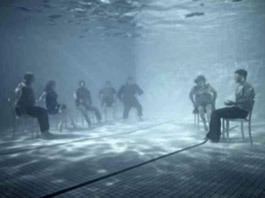 They walk, sit on chairs, look at each other, and occasionally float up to the surface for a breath of air. A gentle aqueous soundscape permeates the under-worldly ambiance of the exhibition space, which contains five floor-to-ceiling video screens and a bio-sculptural heart perfusion system for reanimating pig hearts. In a live performance of unintended but nevertheless ritualistic, almost shamanistic connotations, two fresh pig hearts are brought back to life. Reflecting on the biopolitics of organ transplantation – the match between the donor organ and the recipient being a lengthy process wrought with uncertainty and fears of life-threatening immunological reactions – this paper engages allotransplantation and xenotransplantation as an intercorporeal and a temporal phenomenon. Bringing into play Nancy’s notions of somatic exteriorisation and Latour’s ‘inter-agentivity’, it interrogates the moral and ethical rationale behind breeding living beings to service human organ failure and the unpredictable sequences of inter-somatic interactions.